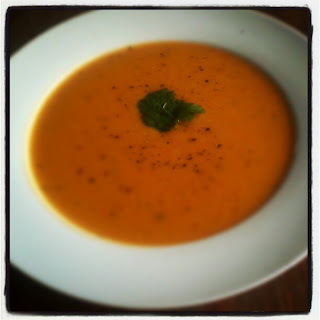 A nice and easy one for you all.. everybody loves pumpkin soup and it's just so simple to make! I love making this one for lunches and freezing portions. Pumpkin soup freezes much better than my vege soups so its a favourite for stocking up! 1/2 Pumpkin, diced - Top Tip - Microwave pumpkin for 10minutes before attempting to chop! Pour in 3 Cups Vegetable Stock, Cumin and Nutmeg. Simmer for 20minutes or until Pumpkin is tender. Mash pumpkin until it forms a thick puree. Transfer to blender and process until smooth. Stir Coconut Cream through the soup and sprinkle Coriander on top to serve!